JH Nunn is exploring new avenues and directions when it comes to Plastic based material handling systems. We carry a wide variety of large plastic storage containers. 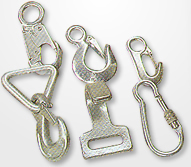 Many of these are fabricated with HDPE structural foam injection molding. This technology is cutting edge and utilizes the latest in robotic capabilities. HDPE Structural Foam offers outstanding production and service capabilities. Our containers meet the needs of a variety of markets with cost-effective and integrated solutions. From the toughest industrial applications to the most sensitive food handling tests rigorous product testing and analysis insure that our containers perform reliably in any material handling environment. Our collapsible bulk containers are available with footprints of 48" x 40" x 30-45"; 48" x 45" x 30-50"; 70" x 48" x 50" and variety of other sizes. Our collapsible bulk containers offer numerous options designed to suit your individual requirements. Options include access doors, removable panels, color choices, FDA approved materials, ribbed or smooth walls, interlocked stacking, 4 way forklift access, sanitary containers that can be easily cleaned and disinfected, optional lids and drain plugs to facilitate washing or emptying the container. Our large plastic storage containers can handle loads up to 2500 lbs with a minimal tare weight because of the ribbed HDPE structural foam construction. 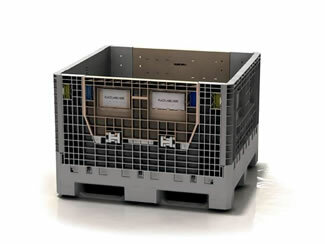 Collapsible bulk containers allow three knocked down containers to be stored empty in the space of one full container. JH Nunn’s large plastic storage containers include fixed wall HDPE structural foam containers that have standard footprint sizes of 48 "x 44 "x 29 and 42 "x 29 "x 28 ". 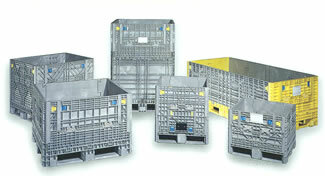 These containers are ideal for uses in many industries. Applications of these large fixed wall plastic storage containers include material handling of small industrial parts, storing large finished goods, handling agricultural products, fish, and food-processing. The solid seamless construction offers a watertight interior perfect for holding pellets, powders and liquids. Lids for these containers feature a smooth, ribbed dome which sheds water. These containers are seamless and when molded using FDA approved HDPE, they are ideal for repeated use when a sanitary container is required. Our large plastic storage containers have been used successfully in the food, chemical, resin, textile and many other industries. 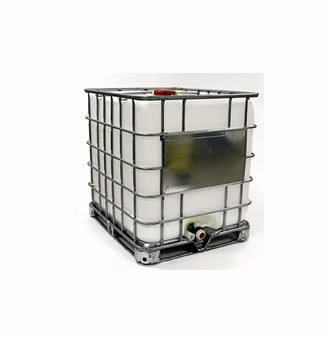 JH Nunn IBC containers are transport containers for chemical and related industries. Intermediate bulk containers are both safe and economical for handling and storage of both liquids and powders. We stock 275 gallon and 330 gallon sizes in new, rebottled and reconditioned inventory. The HDPE blow molded inner container is shaped to ensure complete discharge of contents. The outer container is a rigid welded galvanized tubular steel grid with a palletized steel base to enable 4 way forklift access. IBC containers come with a variety of filling and discharge options. IBC containers simplify transport and stacking, make for efficient discharge, maximize the use of shipping and storage space, and allow multi trip reuse of the IBC container. IBC containers are UN certified for drop and pressure tests. 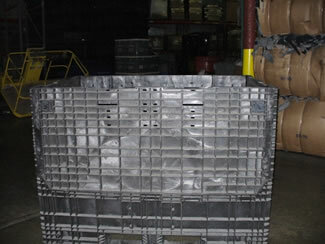 Contact JH Nunn to order the plastic bulk containers you need, or for more information.